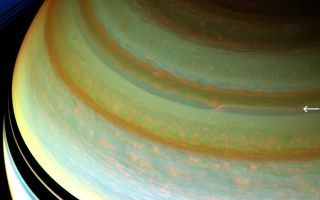 A particularly strong jet stream churns through Saturn's northern hemisphere in this false-color view from NASA's Cassini spacecraft. This cool space wallpaper, a particularly strong jet stream churns through Saturn's northern hemisphere in this false-color view from NASA's Cassini spacecraft. Clouds associated with the jet stream can be seen in the upper right about a third of the way down from the top of this image. The jet stream clouds appear like a thin, bright orange line here. Moving west and closer to the center of the image, the feature drops south. Farther to the west of this discontinuity, or drop, a blurrier form of the jet stream clouds continues to move along the latitude circle.